Day 4 of Sneak Peeks at Clear Dollar Stamps! This is the last day before you can start buying all the wonderful stamps you have seen over the last few days! Woo-hoo! You are going to fall in love with this little set, Pretty Perches. You can do so much with the set! Keep it simply stamped or add bling, this set is so versatile! Our other Designers that are featuring samples on their blogs for Pretty Perches are: Katie, Linda, Cassie, and Laurie (links on left sidebar). This little stamp set has so many uses.....and can be yours for free with an order of $50 or more! Our other Designers that are featuring samples on their blogs for June Stamp of the Month are: Kim, Angela, Linda, and Laurie (links on left sidebar). We hope to see you tomorrow in the store! Have a great week! Day three of Sneak peeks at Clear Dollar Stamps! Day 3 of sneak peeks is here! Our first sneak peek is Charlie Lean on Me.....how cute is he???? This little set is called Sassy Scallops. Have you ever just needed a little something extra on your project? Maybe a little something to add to a scallop or a corner to give it a little extra zing? Here is another customer requested stamp set.....motorcycles! We hope you like them! Don't forget to order your Happy Father's Day stamp! Our other Designers that are featuring samples on their blogs for Motorcycle Mania are: Kim, Angela, Katie, Nancy, Stacy and Laurie. Day 2 of June Sneak Peeks! It's day two and, just as we promised, here are some more sneak peeks for you to take a look at! WE HAVE A NEW STAMP ILLUSTRATOR! We have a new designer ladies and gentlemen! Not only can Kim Teasdale make some of the most beautiful cards out there, now she is illustrating stamps for us! We are so excited.....so let Kim know how much you love her stamps! We have one beautiful flower this month, with a couple other designs of Kim's coming up next month! This stamp is perfect for watercoloring! This box turned out just beautiful! Candy did an awesome job! Our other Designers that are featuring samples on their blogs for Peony are: Kim, Angela, Tori, Linda, and Laurie (links on left sidebar). Shawne has really come up with some adorable stamps with these Patchpal animals! We all couldn't wait to get our hands on them! These are so perfect for anything baby! Look what Candy made with them! Our other Designers that are featuring samples on their blogs for Patchpals are: Katie, Tori, Linda, Sarah, Cassie, Stacy, Shawne, and Laurie (links on left sidebar). Are there times when you just wish that you had a little word to tell someone what to do with your card creation? Candy and I did too! See you tomorrow with more sneak peeks! Hope your day is full of blessings and stamping galore! Let the sneak peeks begin! The moment we wait for every month....to let you know what we have been up to all month! All these sets will be available to purchase on June 1st! The first stamp set we want to show you is Colonial Carvings. This set is just perfect for all your Fourth of July parties, for a friend or family member welcome home card, or just a thinking of you card! Here is what Candy came up with for this set! Our other Designers that are featuring samples on their blogs for Colonial Carvings are: Nancy, Sarah, Stacy, and Laurie (links on left sidebar). Adding to your collection of Flowers of the Month, we have a June Rose! How cute is this little teabag holder that Candy made???? Shawne has been busy drawing.....you will just love her Rosebud Princess, the carriage is the cutest carriage I've ever seen.....I love it! Perfect for birthday invitations, scrapbook pages, and little girl gifts....this set is a must have for a girl mommy! This card was designed by Shawne combining the two sets. It is just beautiful! That's all the peeks we have for today....make sure and come back tomorrow! Announcing our new Guest Designer positions and all the details on how YOU can be the next Guest Designer for one month, using Clear Dollar Stamps new release stamps! Each month, just before the sneak previews begin, we will be holding a stamping challenge RIGHT HERE! JUNE 2009 GUEST DESIGNER CHALLENGE!!!! WHAT DO I DO TO ENTER?? 1. Create any sort of project following the stamping challenge detailed below. This is going to be a Supply Challenge! include a LINK directly to your entry (If you upload to SCS, include this KEYWORD: CDSGDC0609) If post is on your blog, please make your link directly to your post and not just your general blog. Challenge will be open for 4-1/2 days and the winner will be announced on the 5th day, which will be the 1st of the Guest Designers Month, June 1. All projects, no matter what stamps are used, will be a qualifying entry AND considered. However, using Clear Dollar Stamps on your project increases your visibility, but it is not mandatory. You may submit a project using any stamps, but keep in mind it sure helps us to see you use Clear Dollar Stamps on your project. It will show us not only how much you already love CDS stamps by having and using them, but it also helps us see exactly how creative you can get using OUR stamps. Our Senior Design Team will be the judges! They will vote on projects based on creativity, uniqueness, color, and presentation. So, please, DO YOUR BEST WORK! The chosen winner will be our Guest Designer for that release month, and will receive (3) three stamp sets of his/her choice from that month's releases! The Guest Designers term will be for the remainder of the release month, of which during this time, he/she will receive benefits (store discount) and responsibilities (creating samples for the purpose of promotion) of a regular designer for Clear Dollar Stamps! Your samples for promoting CDS with your free stamps throughout the month you are a Guest Designer, are expected to be similar in detail, composition and neatness than that of your entry. 3. At this time, we can only accept entries from those residing in Canada or the U.S, due to shipping times. Now, let's see who wants to be a Guest Designer and get to play with some free stamps! Show us your BEST work! Thanks so much for visiting and have a blessed stamping day! Hi Everyone! Its Katie here and its another Tuesday again. I've got another little box for you today - can you have enough? Not me, I just adore all these paper boxes you find out in blog land. Today's tutorial is specifically for a Dad in your life or even just a great guy you might know. I had so much fun creating this look and I think it would work for just about any guy. My husband doesn't wear ties to work and there are tons of super cute tie stamps and cards out there, but most guys have at least one tool box in a closet or garage whether they are handy or "think" they are handy (lol). Box Base: 8 1/2" x 7"
2 Pieces at 4 1/2" x 2"
2 Pieces at 3" x 2"
2 Pieces of cardstock and some sort of chipboard material at 4 1/2" x 1/2"
2 Pieces of cardstock and some sort of chipboard material at at 3" x 1/2"
Lid: 3 5/8" x 4 5/8"
Making the box is super easy. Take your 8 1/2" x 7" piece and score it at 2" on all four sides. Cut on 2 sides and tape up the sides to create your box bottom. Now, score the top or lid (3 5/8" x 4 5/8") along the 4 5/8" side at the 1/2" mark. Do this same process to all your separate pieces: all 4 sides, all four edges and your top. Shake off the excess and start you gun!!! Once all your pieces are "metaled" then its time to adhere them to your box sides. Its important that you get whatever your adhesive your using as close the the edges as possible. I've been using ATG tape, but the Scor Tape is awesome tape. Amazingly enough, you can just tear the stuff - seriously! Adhere your edge chipboard pieces to your cardstock edge pieces. Then glue the edge pieces to the top eges of your box. This next step I call my soldering step. Grab your Versamark ink pad and rub it on the edges of your box and then dip gently into a the silver embossing powder. Tap excess off and heat. Find the middle of you box and punch a hole about 1/8" down from the top edge. Add your small silver brad, but make sure that you don't push it all the way in. You want it to stick out just a bit. Grab your lid and apply adhesive to the 1/2" section. Be generous here you want it to stick! Now apply it to the back of your chest. Now its time to attach your photo hanger or anything that you might have that has a loop on it. I placed the hanger and then pulled the lid down and marked the spot with a pencil. Here is the finished box. I'm sorry I don't have anything to put into it...I'll have something by Father's Day. The chest measurement is 4 1/2" wide, 3" deep and 2" high. You'll see how it compares to an A2 card in a picture down below. More than likely, I toss in a "manly" gift card and some of his favorite candies. And the card: I used my Cricut machine and cut out the letters for Dad using Base Camp for the chest lid and the card. For the card, I decided to use the same basic embossing for the letters and created my background texture with a cuttlebug embossing folder. The awesome screw brads can be found HERE. I hope you had fun today and will try your hand at this super easy Tool Chest for the man in your life. If you do so, make sure to let us know and share a link. If you have any suggestions of goodies to stick inside, share those too. As always, thanks so much for sharing your time with us and I hope you have a wonderful Tuesday! 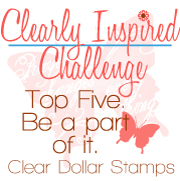 There is a lot going on here at Clearly iStamp and Clear Dollar Stamps this week. Sneak peeks are going to be starting and you will love all the new stamps. Plus, another opportunty for YOU to be a GUEST DESIGNER coming up real soon. Keep your eyes open for the announcement. This week I decided to work on my prayer space and getting it organized! I love getting organized and I don't have nearly enough time to do that! Plus, adding all my little stamped friends makes it all that more cozy and inviting! The first thing I wanted to organize were my prayers from others to make sure everyone and everything gets prayed for on a regular basis! Take off the band and look what you see! You may have other sets with different critters, so feel free to use those instead! I decided that I wanted to start my organization with some of the little soft fold boxes. I wanted to organize mine by the days of the week so I used 7 boxes. The Prayer Journal Set has words you could organize with such as friends, family, praises, church, personal growth, and so on....which would also be a good way to organize your prayer requests. If you are organizing by days of the week, you would need to cut the flaps off of seven boxes. You are going to make 6 cards altogether to create your Accordian Prayer Box. You will need to cut your card base 3 x 6 1/4. That way you have a little extra space for the fold when it attaches to the box. I used the Nestabilities Labels 3 to bring unity to all my cards. Tombow markers are listed for each and can be found in my store in this section: markers. For a tutorial on how to use the Tombow watercolor markers go here. You are going to love these....they are my favorite! The cardstocks I used are SU Kiwi Kiss, Taken with Teal, Not quite Navy (wish I'd used Taken with Teal on this one too), Rose Red, and Marigold Morning. Tombow markers: N65, 912, 451. SU Taken with Teal ink for the words. Tombow markers: 025, 076, 452, 925. SU Soft Sky ink pad for words. SU ink pad Taken with Teal for words. Tombow Markers: 452, 772, 076, 969, 977, 026. SU Kiwi Kiss ink pad for the words. Now that all our cards are made, we need to put them together. I used the Scor-tape to attach my cards to the boxes to make my accordian. Make sure the fold of the card is right on the edge of the box. When you go to attach the next box and card, you need to place the fold of the card on the opposite side of the box. Continue until all seven of your boxes are attached. I made a surround to hold my box together that is 1 inch wide and stamped the verse all the way around it. The dividers are 3 x 4 inches tall. The white strips across the top are 1/2 x 3 inches. I then cut white pieces of cardstock 3 x 3 1/2 inches tall and made the actual prayer cards (you could use the 3x5 index cards you buy at the store). I stamped my prayer cards with the Dotted Journaling Lines. After I got my little accordian box done, I started thinking about all the different uses for a day of the week box! 1. Rotating chores around the house....wouldn't it make you a smidgy cheerier to get a chore done if you got to use your box....well it couldn't hurt! LOL! 2. Rotating chore box for kids. 3. To do lists for the week. I sure hope you enjoyed this project as much as I do....I can't wait to start using it....I actually made something for me! Woo-hoo! These would also make awesome birthday presents, baptism presents, graduation presents, and more! While everything is out, I think I will go get some matching cards made to send to people I pray for! More next week on "Organizing your prayer space"! Good morning friends! Its Tuesday and its Katie here to share several of my favorite things with you. One of my favorite things is/are Basic Grey paper and especially the Basic Grey 6x6 paper pads. Lori has a great selection that you can check out HERE. Today's project features 2 very brand new pads called Wisteria and Lime Rickey. They are both just yuuummmy!!! Here is a picture of the cards and box that I created for today's tutorial, which leads me to the other favoite thing of mine. I love 3x3 cards and boxes of any kind! But before we get started lets take a peek at these two new Basic Grey Pads. So, lets get started shall we? We'll start with the cards first. As I stated earlier, I love 3x3 cards, but I also love to use up as much paper, especially really yummy paper, as I can. We crafters are hoarders and we tend to horde our scraps too. Don't tell me you don't horde, because that is just a given (lol). I used less than 5 sheets combined of the Basic Grey designer paper, with scraps that can honestly be throw away without a care in the world. For your cards, you will need to start out with Eight 3x3 cards either purchased or cut. Then you will take one sheet of 6x6 paper (your choice) and cut it down to 51/2" square. You will be left with 2 strips that are 1/2" wide. Before you attach this gorgeous paper to your card fronts, I suggest you add the lace first. This ribbon is very pliable but sturdy enough to just wrap around and attach to the back. The great thing about the Basic Grey is that its also sturdy enough to handle having the crochet ribbon being attached this way. I go ahead and put my adhesive down first and then attach the ribbon to the backside. Then you are ready to place the Basic Grey to the card front and decorate. So, even though these are 3x3 cards and you can't mail that size (unless you place into a larger envelope), I still like to have the correct size envelope to go along with the card. I personally have a great template, but I don't like to cut out the entire thing so I get my Scor-Pal and make them that way. These are generously proportioned with lots of wiggle room. For these particular envies, I used computer printer paper. They are kind of thin, but you can always purchase thicker printer paper if you wanted. Paper that measures: 7 7/8" x 4 7/8"
Here's the key: Line up the long edge of the paper so its on your left. Move in so that it is aligned with the second mark which is the 1/4" mark and then score at 1". Now do the exact thing to the other side of your piece of paper. After both left and right sides are scored then turn your paper so that the shorter side (4 7/8") is lined up to the left side of the Scor-Pal. Move your edge over so that it lines up with the 3rd mark which is the 3/8" measurement and score at 3"
Turn your paper so that the right edge is now on the left edge. Line your edge so that it matches with the first mark (which is the 1/8" measurement) and score at the 2" mark. Now its just a matter of folding, a little snipping and gluing. Here's a hint for you: If you don't want to use your scissors to cut off your tabs, place your piece of paper into a Fiskars cutter and line up your cut lines and use your sliding blade just to cut the lines you need to. When you want to move to the next spot, just lift the arm and move your blade to the next position. Once you have all 4 corners cut, you are almost done. Fold up the bottom and top flaps to round the center corners if you want to. Fold the center flaps in and apply adhesive to the bottom (the longer section) side edges. And fold up and you've got your envelope. Now to add a little bit of umph to the envelope, remember those extra strips you had left over and the extra ones you cut? Now is the time to apply some to your envelope. Because your strips are going to be shorter than the width of your envelopes, I center them on to my flap but then take an exacto knife to "clean" the edges up. It not only makes for a pretty accent but also makes for a very finished looking envelope. You could do the exact same thing to the plain envelope too. Below is a picture of the finished flap of the envelope after its been "cleaned" up. And finally, I use this stuff to get the "relickable" sticky on my envelopes. I got mine a long time ago with a set of envelope templates that I purchased from Greansneakers. I think that Stampin Up also has this product or something similar. I love this stuff! You can also do this to the bottoms of the envelopes before gluing them together. The Scor-Mat is great for those fine measurements. I just lined up my edges and used the 1/8" mark increments to guide me. These cards are done, but I decided to make 4 more since they are so simple and fast to put together. This Basic Grey paper has such detail and style that there doesn't need to be a lot of additional work especially with these smaller sized cards. I decided to go with a very different design so my gift recipient would have a choice as to what design to give away. My next set of cards features the Lime Ricky design. I wanted to create a slightly more "manly" card with simple lines. I did the same thing as with my Wisteria sheet. Took one 6x6 and cut it down to 5 1/2" square and then cut it in half at 2 3/4" and in half again so I ended up with 4 squares measuring 2 3/4" square. I adhered those pieces onto the fronts of my cardstock and then I decided for these cards I would put my sentiment on the front. I cut 2 strips of a coordinating piece of Basic Grey paper, 1/2" wide and then cut those into 3" strips. I used another sentiment stamp from a stamp set called Words of Gratitude. I love this vertical thank you. Its clean and simple. Then I just added some embellishments to the tops and bottoms of my stamped strips, then adhered them onto my card fronts. I did the same thing with my left over strips as I did with the notecards above, but I kept my card insides blank and only attached one strip to the bottom. Out of 2 sheets of Basic Grey, I still had this much left over and only that one little strip left, plus one extra envelope that I made. So... you want more??? I now have a coordinating box tutorial to show you!! I decided to go with a white base for this box, but you could easily use any color you wanted. Start with a piece of cardstock that measures 10 1/2" x 12"
Along the 10 1/2" side score at 3 1/2" and 7"
Turn your cardstock and along the 12" side score at 3 1/2" and 8 1/2"
Cut where shown on the picture below and fold side flaps and secure. Now for the BOX INSERT measurements. You will need a piece of cardstock that measures 6" x 8 1/4"
Along the 8 1/4" side move the edge of your cardstock so that it lines up with the 2nd mark (1/4" measurement). Score at the 1 1/2" mark. Turn paper and do the exact same thing to the left side. Along the 6" side score at 3 1/2" on both the left and right side. Cut where shown on the picture below. Close side flaps and adhere. Place the BOX INSERT into the middle of the larger card box. Place adhesive on the sides and bottom of INSERT. You will need another piece of cardstock that measures 5" x 6"
Along the 5" side score at 1" and 4 1/2"
Fold and then attach the smaller section to the back of the box. I placed both sets of notecards in the 2 outside compartments and placed my envelopes in the middle. As you can see there is clearly enough room for many more. Well there you go! Thanks for hanging in there with the huge amount of photos. The Basic Grey are awesome pads of paper and quite usable. They work perfectly for making these little 3x3 cards with just about no waste. Imagine how many gifts you could make with just one pad of paper, so don't forget to stock up when you go shopping. Thanks for stopping by today and I hope you have a wonderful Tuesday! -Katie signing off for Clearly iStamp.